Recently I’ve been doing a lot of thinking about how to open up our political process and truly democratize it. When asked, many people believe that viable third party candidates (say those who can theoretically win) should be able to attend nationally televised debates and be covered by the mainstream press. In other words, the average American would agree that political candidates should be given a fair chance at getting their issues and solutions in front of the American public, regardless of political affiliation. Opening debates is one much needed step to greater democracy in this country. The other step, and one I find very interesting and full of potential is to enact Instant Runoff Voting. Photo credit to Andrew Teman. Basically, Instant Runoff Voting [IRV] is a system of voting where candidates are ranked in order of preference by the voter. Depending on the particular IRV system you can either rank as many or as few candidates as you wish or you must rank all candidates. In either case, once all ballots are cast, the candidate in the #1 spot on the ballot is awarded one vote. After all the ballots are analyzed and added up, if any one candidate has a majority of the votes (e.g. more than half), then he/she is declared the winner. However, if not candidate receives a majority of votes then the lowest ranked candidate on each ballot is eliminated and the votes are redistributed to the remaining candidates. This process continues until one candidate has a majority of the votes cast. Like any system, IRV is not perfect, but I believe it would be an upgrade over the electoral college system and allow more candidates a realistic chance at winning, and thus increase competition which helps everyone. So let’s run through my thought process. First, all candidates were ranked to ensure that my ballot counted through each round. If my ballot only ranked two parties, let’s say Nader-Gonzalez first and Baldwin-Castle second, then if more than two rounds of run-offs were needed to get a majority winner my ballot would become exhausted and no longer add support for either Gonzalez nor Castle. In terms of actual candidates, McCain-Palin were ranked last because they are my least preferred presidency. Next, Barr-Root are ranked second to last because frankly, I find them to be highly disingenuous and highly suspect they are Republicans masquerading as libertarians. Bob Barr ran a poor campaign and alienated those who were most likely to support him while WAR (Wayne Allen Root) comes across as someone who does not do any research and instead blindly lambasts the government for everything. If WAR is so against government he should not be running for a government job. Next up are McKinney and Clemente, who would be my number two choice but neither seem qualified to lead. McKinney, as noted in my review of her, is brash, abrasive and arrogant, which are not the traits of a good leader. Next I place Obama-Biden. Biden scares me, but the one aspect of Barack Obama we all must admit is that he runs one hell of a tightly organized campaign. I do not agree with many of his stances, and believe he is too closely aligned with corporate interests, but Obama does have the ability to motivate a large group of people and get his message across efficiently. He might not be my first choice for president, but I’m glad he’s an American citizen and not running for president of some other country. Next up I ranked Baldwin-Castle, purely because they come across as genuine and seem willing to compromise and co-operate. I also consider myself somewhat of a fiscal conservative which aligns closely with Baldwin’s fiscal plans. Finally, I ranked Nader-Gonzalez as my top choice for president because I agree with nearly all of his stances, especially his socially liberal and progressive platform. Check out my top ten reasons I’m voting for Ralph Nader and Matt Gonzalez post for more details about the choice. 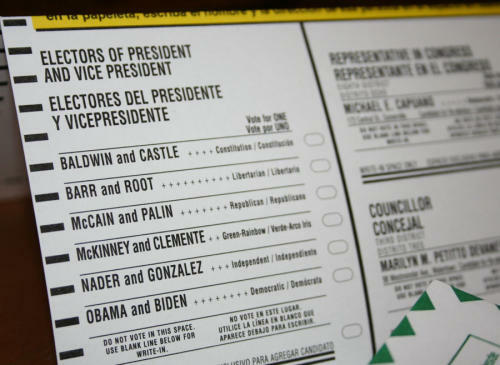 So there you have it, what would your Instant Runoff Voting ballot look like? this is an idea i could get behind. As would a majority of citizens (I believe), hence why it would be immensely difficult to get passed. The Democrats and Republicans would for sure be opposed, even though IRV still leads to a two party system but with strong third parties. P.S. If you do want to see this idea, vote Nader-Gonzalez. Obama has already won Massachusetts so no worries on helping McBush and Nader-Gonzalez are actively pushing IRV ballots and already helped implement them in San Francisco. A novel idea. Although, I’m glad you endorsed Obama! Susan, certainly it’s a more democratic way of electing government officials as we can show our preferences instead of being forced into a “lesser of two evils” dilemma. Obama is certainly an upgrade over Bush and McCain, but whether he’ll be a good president is a whole different issue. Hopefully he proves to be a true progressive and accomplishes a lot of positive change (we sure do need it). IRV is already winning adoption in the U.S. My own city of Burlington (VT) has used it since 2006. We convinced the Democrats in the legislature to pass an IRV bill for statewide federal elections (unfortunately the Republican governor vetoed it). IRV is a very important pro-democracy election reform. No voting method is perfect, but political scientists and voting method experts widely agree that the plurality winner-take-all voting method generally used in the U.S. is the worst of all. IRV eliminates the “spoiler” problem, and opens the door to multiple choices and parties, broadening and strengthening political debate. IRV also has a real chance to gain widespread use in the U.S. (unlike some other pet election reform methods that have a tiny group of Internet supporters), and just yesterday was adopted by Memphis (TN). Your great idea noted here will soon spring to life. There is a coalition forming to get the IRV question on the ballot for the next election! Jill Stein of the Green Party, and several other organizations are building our petition drive capacity as we speak. And we just filed our papers yesterday. We will have September to December to get enough signatures. We are building up our activist base now. Please email me as soon as possible so we can discuss this further. Definitely dig your passion for the issue and look forward to connecting!